The Council for Economic Education (CEE) is thrilled to announce the launch of the #MySavingsStory Video Campaign to inform and inspire kids to understand and take control of their financial lives. 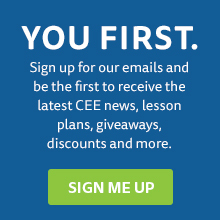 We’ve enlisted fashion designer Elie Tahari, best-selling author of Diary of A Wimpy Kid, Jeff Kinney, entrepreneur Rosie Pope, and others to share, via videos, what they’ve learned about the importance of financial literacy and saving. Below you will find the names of those involved and dates when their videos will be released throughout Financial Literacy Month. 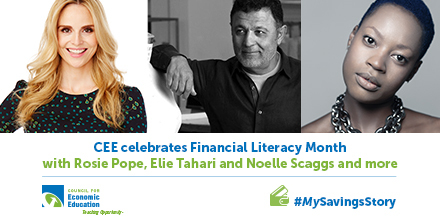 Make sure to check our Facebook page to watch their #MySavingsStory videos and hear their personal finance stories and savings advice firsthand! Through these personal stories, we hope to demonstrate how critically important financial literacy is for our nation’s students. Also, we encourage you to share your own #MySavingsStory with us! You can do so by creating your own video (60 seconds or less) or by posting a personal finance story/lesson to your Facebook page and/or blog. Make sure to use the #MySavingsStory hashtag when sharing and tweet us at @council4econed so, we can further spread your story.